As the opioid epidemic continues across the county, authorities are also confronting the return of another scourge – one they thought they’d conquered years ago. In this project, we set out to study over a decade of data relating to the DEA’s efforts to disrupt the production and distribution of meth. Analyzing thousands of meth lab busts and seizures nationwide, we’ve tracked the geographical and chronological trends of this resurgent threat. More importantly, our data give you a chance to learn where meth has been made in your own community in the past and where it continues to pose problems. To see where meth has been made across America, keep reading. Meth Cooked Close to Home? Drug production often entails some agricultural element; poppy, cocoa, or marijuana cultivation can utilize vast tracts of land. But because meth can be made using inexpensive chemicals found in over-the-counter medications, it lends itself to clandestine manufacture inside inconspicuous buildings. These meth labs have been discovered in every state, sometimes because an error in the “cooking” process produces a deadly explosion. But in many cases, neighbors are completely unaware that they live near the current or former site of a meth manufacturing operation. This interactive presents more than a decade of DEA meth lab bust data, so you can learn whether a meth lab once existed close to your own home. Adjust your address if necessary, and discover whether a meth lab once existed just a few streets or miles away from where you live currently. No matter what you discover, this process may make you uneasy: What could be taking place inside the unassuming homes in your area? Perhaps America’s meth troubles are more local than you imagined. Although no state is entirely unaffected by meth’s presence, certain places emerged as manufacturing hubs in our analysis. Missouri had 27.6 meth labs per 100,000 residents; authorities regarded the state as America’s meth production capital until Mexican cartels came to dominate the trade in recent years. 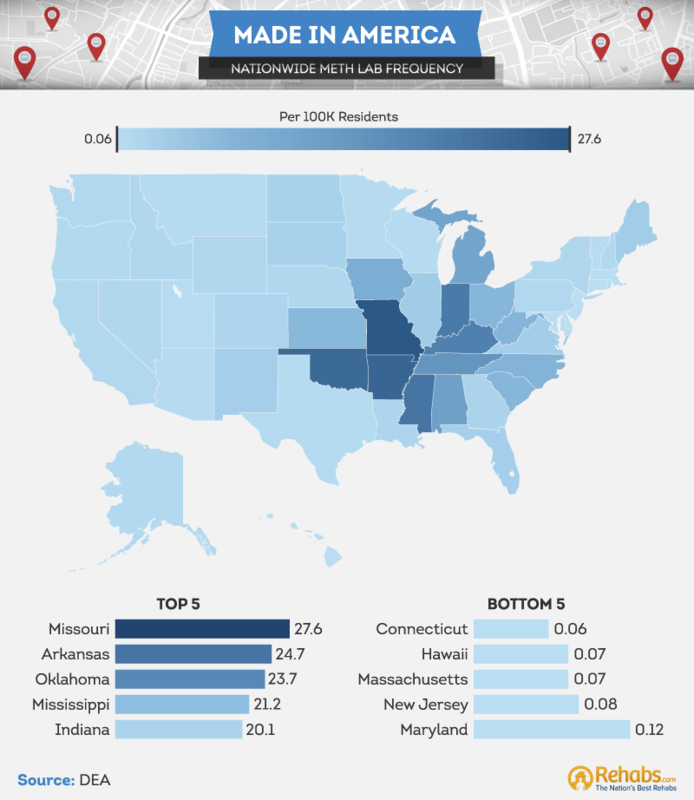 Several Bible Belt states also witnessed a striking number of labs per capita, including Oklahoma, Arkansas, and Mississippi. Fans of “Breaking Bad” may be surprised to see relatively few lab operations in New Mexico – the celebrated drama about a chemistry teacher turned meth trafficker played out in Albuquerque. 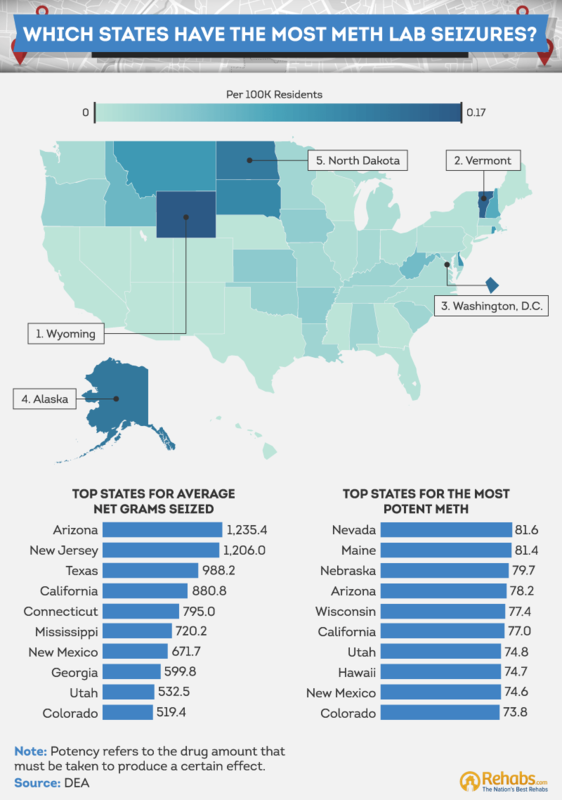 Northeastern states tended to have fewer meth labs per capita: New Jersey, Massachusetts, and Maryland ranked among the bottom five states on this measure. Connecticut had the fewest overall, an interesting finding given the high rates in states further down the Eastern Seaboard, such as both Carolinas. Hawaii had relatively few labs per capita as well, a stat that contrasts sharply with the state’s past and current struggles with the substance. Local law enforcement has considered “ice” a dangerous threat to the islands since it arrived from Asia over three decades ago – and use shows few signs of slowing. In DEA busts in which methamphetamine was seized, the quantity and purity of the confiscated product varied considerably. The states in which seizures were most frequent, such as Wyoming and Vermont, did not have the biggest busts on average. Likewise, states with the largest average amounts seized had relatively few seizures per capita. These patterns may reveal differences in law enforcement strategy by state: In places with concentrated manufacturing networks, big stings can be effective. In places where meth-making is more diffused, a greater number of smaller busts may be warranted. Average potency figures from each state also presented compelling contrasts. Nevada had the highest degree of purity overall; perhaps it’s no surprise that the state leads the nation in deaths resulting from the use of stimulants. Meth seized in Maine was nearly as potent, and the crisis in the state has caused lawmakers to consider requiring a prescription to purchase cold medicine containing precursor ingredients. But the most concerning mix of statistics may have emerged from Arizona. Ranked first for average seizure size and fourth for potency, the state possesses a deadly mix of quantity and potency. 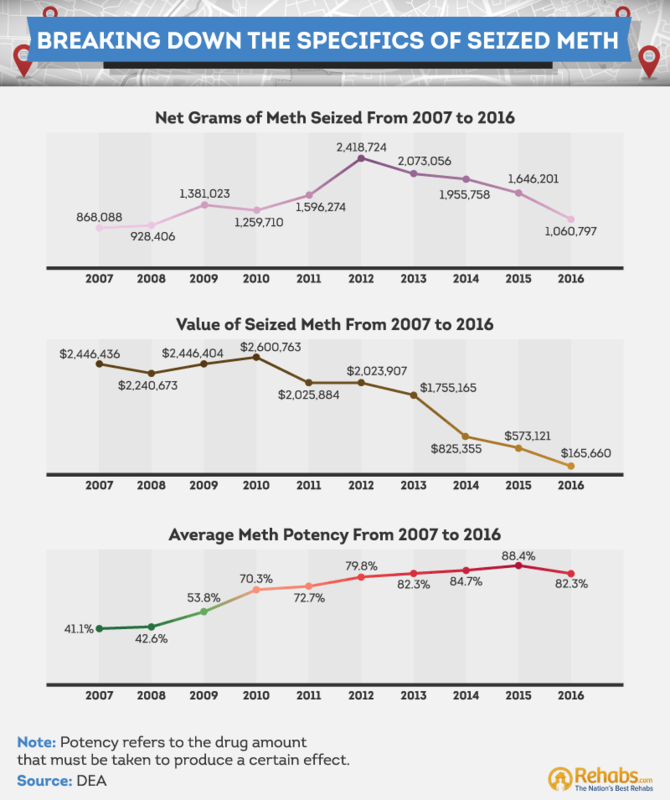 Our data permit us to study the volume and potency of meth seized from 2006 through 2017, tracking trends over that period. In terms of the total amount of meth confiscated annually, the amount seized increased significantly between 2006 and 2012, before falling in each subsequent year. Although this trend may seem encouraging at first glance, the decline in meth seized may simply reflect a change in manufacturing patterns. Whereas confiscating product from domestic labs was once a reliable strategy for seizing large quantities of meth, much production now takes place in Mexico instead. The street value of meth seized by year has also declined precipitously in recent years, and not just because less has been seized overall. Meth has become increasingly affordable as of late, another trend authorities attribute to industrial-scale cartel production. Simultaneously, the potency of meth has skyrocketed. In 2007, confiscated meth was 41 percent pure on average. In 2016, it was exactly twice as potent. Our findings reveal a grim set of circumstances: Meth is more potent than in its mid-2000s heyday, and far more affordable as well. In many states, lab busts have been exceedingly common; in others, a startling amount of methamphetamine has been seized. In many ways, meth’s return to national prominence indicates the limits of drug interdiction. Although meth’s availability declined for a time as domestic production slowed, other sources have since moved to fill that void. Halting the flood of drugs is a worthy ambition, but policymakers must address the demand for these substances as well by investing in treatment resources. For those desperate to end their drug use, navigating the complex array of substance abuse treatment options can be difficult. In fact, access to treatment in America presents a cruel irony: Getting drugs is often easier than getting help. If you find yourself in this position, don’t get discouraged from seeking the care that could save your life. Our team of treatment experts will help you identify affordable care options specifically tailored to your needs. Explore our resources today to learn how you can begin your journey to recovery. We collected data from the DEA (National Clandestine Laboratory Register and Drug Seizure Database) from 2007 through 2016, totaling 29,746 records. Take note, these are not all the clandestine laboratories in the US, these are just the laboratories the DEA has found from 2007 through 2016. In addition, we used data related to the state in which the substance was obtained, the method of acquisition, the drug name, net weight, potency, calendar year collected, and value of the seized meth. Please help us spread the word about the prevalence of methamphetamine production in the past and the return of that threat in recent years. To do that, you’re welcome to use our content on your own website or social media for noncommercial purposes. We simply request that you include a link back to this page to attribute our team properly.